Crossing over Warm Springs Run we find the Roman Bath House. It is one of the oldest structures in the park although the truth of its construction is unclear. Surviving 18th century documents agree that after 1784 a Gentlemen’s Bath House was built on this site. It had five bathing chambers, 5 x 18’ and dressing rooms — clearly not the current structure. No period documents mention the original structure’s designer or builder although local legend attributes it — and two other buildings described in an 1787 diary — to inventor James Rumsey. Analysis of Rumsey’s work patterns during his brief time in Bath and his later inability to finish projects make the undocumented claim suspect. Notes taken from now-missing Minutes of the Bath Trustees suggest the present Federal brick structure “used for the gentleman’s bath house” was constructed in 1815-16. Analysis of architectural features support this dating. The original period of colors of yellow, cream and green are now used on this building and throughout the park. The baths in this structure have always been heated. Boilers have been located both inside and outside the structure. Descriptions of the baths from the 1850s describe exactly the structure as it is today. There is no clear indication of when it went from gentlemen’s baths to public baths although it was not until the 20th century. The Roman Baths housed on the ground floor of this building are open to the public daily, year round from 10am-5pm. Naturally warm, mineral waters coming from the main springs behind the building are heated to 102° and fill nine 5’x 9′ and 4′ deep tiled swimming baths in private rooms. Operated since the 1920s by the State of West Virginia, the baths were refurbished in 1995. The baths may be rented by the half hour by an individual or couple. 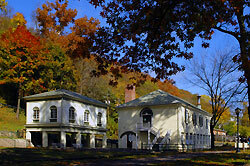 Click here for an interactive map of the Treasure Tour of Berkeley Springs State Park.